Blaze new trails to the far reaches of the cosmos—and be back in time for dinner. I’m staring at the Great Red Spot, a giant ruddy hurricane on Jupiter, slowly rotating in front of me as though I were looking through the porthole of a future manned spacecraft. Seconds later, after taking a quick spin around the vast planet, I hover over the volcanoes on the moon Io, as if preparing for descent. Instead, I throttle back to take in the entire moon, which looks like a bruised olive orbiting above Jupiter’s permanent storms. Then I set off for icy Europa, a neighboring moon, and fly over the crater formation of Callanish. As I view the landscapes, text overlays explain the latest theories about them. These computer simulations are served up by the free Web-based software program Celestia, which features graphics so convincing that you feel as if the age of space tourism has arrived. Better yet, in the digital universe of Celestia, anyone can be a guide. Unlike other popular astronomy programs such as RedShift and Starry Night, Celestia allows ordinary space fans to create their own customized tours through the galaxies and share those tours on the Internet. Ever since Archimedes made an ingenious mechanical device to demonstrate the motions of the sun, moon, and planets, visionary sky watchers have developed increasingly elaborate tools for creating the illusion of seeing the universe from new vantage points. In the early 1660s Andreas Busch, an enterprising German engineer, and Adam Olearius, a Dutch mathematician, constructed one of the most famous of these: a 10-foot-wide hollow sphere, later dubbed the Gottorp Globe, which had the continental outlines of the known Earth painted on its outside surface and rotated once every 24 hours. On the inside of the sphere, Busch and Olearius etched a heavenly vista: hundreds of gilded stars mapped with astronomical precision for that era. Standing on a platform in the globe, would-be space travelers could watch the star field rotate ever so slowly and imagine they were floating in space, liberated at last from Earth’s partial view. In the early 20th century, that otherworldly experience became commonplace as people flocked to museum planetariums and discovered they could explore the cosmos without leaving their chairs. The first time you launch Celestia, it deposits you a few thousand miles outside Earth’s atmosphere, with the continents and cloud formations of the blue planet spread out before you. Then you control your position and velocity using a series of simple keystrokes. Press a key and you’ll accelerate past Earth, while the moon whizzes by like a gas station on the interstate. Conventional speed limits don’t exist in Celestia’s universe. Holding down the same key enables “exponential acceleration.” After a few seconds you’ll be flying at several times the speed of light, and soon the Milky Way will be a distant blur in the rearview mirror. Celestia also includes shortcuts: At the press of a button you’ll be transported to Mars, Saturn, or—with a little tinkering—any location in the universe that you’ve defined. In addition to traveling through space, you can travel through time in Celestia. You can position yourself outside our solar system and watch the planets zip around the sun as if the universe were running on fast-forward. You can also set the clock to specific days in history. You can visit the Russian space station Mir starting on February 20, 1986—the day of its launch—but you’ll be out of luck if you try to find it with the clock set later than March 23, 2001—the day it finally fell back to Earth. The calendar feature lets you visit all sorts of historic interplanetary events; Chris Laurel likes to show Celestia newcomers a rare triple eclipse that occurred on Jupiter in November 1997. 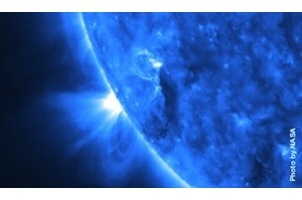 Or you can jump ahead to the future and get a preview of the next transit of Venus across the sun in 2012. You can also lock on to a specific object in Celestia and travel alongside as it journeys through the cosmos. Lock on to Earth, for example, and you’ll witness a Ptolemaic vision of the solar system—our home planet motionless while the sun and the other planets appear to fly around it. Or you can hitch yourself to the tail of Halley’s comet as it streaks through the solar system. Locking on also gives you a wonderful way of experiencing the missions of space probes launched from Earth. The latest version of Celestia includes a stunning re-creation of the Cassini mission, from launch to its insertion into orbit around Saturn. Lock on to Cassini, accelerate time, and you’ll follow its trajectory past Venus, Jupiter, all the way to Saturn’s moon Titan, whose hazy orange atmosphere is dotted with small clouds revealed by the probe’s cameras this summer. Much of the richness of Celestia comes from the open-source design of its software, which allows interested programmers or space fans to make significant contributions to the program and the data it contains. That includes everything from fixing bugs and optimizing graphics routines to adding entirely new features or celestial objects. Hundreds of people have made add-on files, and a Web site now exists for coordinating all their contributions. Laurel points out that one of the most ingenious tweaks to the software came from the open-source community: Celestia-specific URLs. You can take a snapshot of your universe, capturing your position in time and space, and embed that information in a link on a Web page. Other Celestia users who click on that link will be transported to the exact position in the universe that you captured. Every astronomy buff has favorite landmarks that he or she points the telescope toward when introducing a newbie to the wonders of the cosmos. Celestia snapshots give those enthusiasts a light-speed viewing platform for sharing their idiosyncratic vision of the universe: not just a view through an eyepiece but a compelling on-the-scene visit. Aspiring cosmic tour guides with a modicum of programming experience can blaze a trail through the stars, annotating with snapshots as they go, and then upload those travels to the Web for millions to experience on their own personal computers. A quick search through the celestiamotherlode site uncovers detailed excursions to each planet, along with more adventurous journeys that take you from outside the Milky Way all the way to the surface of the sun. Celestia can also take you to places that never existed. Because the program’s architecture allows users to contribute new objects, many community members have concocted add-ons that re-create fictional worlds from sci-fi lore: the planet Tatooine from Star Wars, for instance, and the space station from 2001: A Space Odyssey. Some individuals, such as Runar Thorvaldsen, a Norwegian graphics designer, have taken the fictional possibilities of Celestia to new heights of inventiveness. Laurel raves about Thorvaldsen’s Off on a Comet, a Celestia-based rendition of Jules Verne’s 1877 novel, which tells the tale of 37 people stranded on a comet. “It turns a scientifically accurate simulation into Victorian fantasy art,” Laurel says. To me the most powerful demonstration of Celestia’s open-ended system is another Thorvaldsen creation. After downloading a few files from his site and depositing them in my Celestia folder, I found myself staring at a blue planet, cloud formations swirling across its surface, its vast oceans punctuated with landmasses and polar ice caps. It echoed satellite images of Earth I’ve seen a thousand times before, but something strange started to needle me—something out of place. So I spun my virtual spacecraft around the globe and zoomed in for a closer view, looking for familiar landmarks: Australia’s floating continent, the mirrored coastlines of Africa and South America. Then I realized I wasn’t looking at Earth at all. I was looking at a painstaking simulation of what Venus would look like if it were terraformed—remade into an Earth-like planet with water, oxygen, and a life-friendly climate. While hovering over Thorvaldsen’s Blue Venus, I thought about Busch and Olearius’s miraculous globe. Astronomy has always been sustained by a vast following of armchair enthusiasts, but in modern times simulated space travel has been dominated by museums and universities with the resources to run planetariums. Celestia returns the space tourism fantasy to the tinkerers and the hobbyists. What these amateurs lack in government grants and advanced degrees they make up for in enthusiasm and imagination. They may give you more Star Trek references than your average planetarium guide, but there’s something undeniably magical in getting a glimpse of a stranger’s personal collection of interstellar vacation snapshots.